Of course, she and Hitler had a very passionate and intimate love life. Because nobody knew of their relationship but Eva and Hitler, nobody was there to acknowledge the turmoil she at first went through. In 1932, after the death of Hitler’s niece, Gall Raubal, Eva became his mistress. Her father disliked the fact that she was living with Hitler because of his political associations. In her lover’s first will in 1938, three years after an obvious suicide attempt, he bequeathed her 600 lira a year for the rest of her life, a Mercedes, and a chauffeur. Because he loved her, he wanted only the best for her. Nothing was a problem or an expense. Not even death. After waiting many years for Hitler to marry her, on April 29, 1945, a local magistrate finally married Eva and Hitler. By marrying him, Eva agreed to share Hitler’s fate. Around 3:30 p.m. the next day, both of them bit into vials of cyanide and Hitler shot himself in the temple with a 7.65 mm Walther pistol – Eva chose only to poison herself. Both bodies were brought into the Garden of the Chancellery, doused with gasoline and burned. Burning does not necessarily mean that the bodies were completely disposed of. The Soviet Troops moved in and buried what was left of Hitler and Eva. After hiding the graves, then digging them up, the Soviets moved the remains elsewhere. Twenty-five years later the areas where the bodies were finally placed was owned by a waste disposal company. In 1970, Eva and Hitler’s bodies were dug up in Magdeburg and destroyed. Although Eva did not live through the War, Eva’s family and extended family survived. In 1976, her mother, Franziska, died at age 96. Not much else is really known About her family. Eva Braun was a very distinguished woman, and lived an interesting life. Hitler’s mistress from 1932 and his wife during the last few hours of his life, Eva Braun was born in Munich, the daughter of a school teacher. Of middle-class Catholic background, she first met Hitler in the studio of his photographer friend, Heinrich Hoffmann, in 1929, describing him to her sister, Ilse, as “a gentleman of a certain age with a funny moustache and carrying a big felt hat.” At that time, Eva Braun still worked for Hoffman as an office assistant, later becoming a photo laboratory worker, helping to process pictures of Hitler. The blonde, fresh-faced, slim, photographer’s assistant was an athletic girl, fond of skiing, mountain climbing and gymnastics as well as dancing. 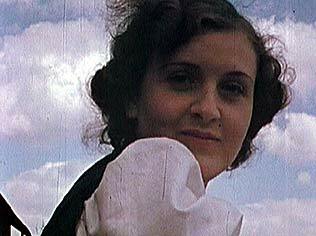 After the death of Geli Raubal, Hitler’s niece, she became his mistress, living in his Munich flat, in spite of the opposition of her father who disliked the association on political and personal grounds. In 1935, after an abortive suicide attempt, Hitler bought her a villa in a Munich suburb, near to his own home, providing her with a Mercedes and a chauffeur for personal use. In his first will of 2 May 1938, he put her at the top of his personal bequests – in the event of his death, she was to receive the equivalent of £600 lira a year for the rest of her life. In April 1945, she joined Hitler in the Fuhrerbunker, as the Russians closed in on Berlin. She declined to leave in spite of his orders, claiming to others that she was the only person still loyal to him to the bitter end. “Better that ten thousand others die than he be lost to Germany,” she would constantly repeat to friends. On 29 April 1945, Hitler and Eva Braun were finally married. The next day she committed suicide by swallowing poison, two minutes before Hitler took his own life. On Hitler’s orders, both bodies were cremated with petrol in the Reich Chancellery garden above the bunker. Her charred corpse was later discovered by the Russians. The rest of Eva Braun’s family survived the war. Her mother, Franziska, who lived in an old farmhouse in Ruhpolding, Bavaria, died at the age of 96, in January 1976. Courtesy of: “Who’s Who in Nazi Germany”.